The next thing she knew, the retired computer programmer from Englewood was standing among fellow patients, who also had recently joined the more than 580,000 Americans to undergo knee-replacement surgery every year, with music playing and physical and occupational therapists vowing to whip them back into shape. OK, there was no whipping involved. And Cvelbar, 56, will attest that while Swedish Medical Center's Total Joint Boot Camp is not easy, it's a great way to launch patients down the road to recovery in rapid-fire fashion, which experts say can make a big difference. "Yes, it's hard the day after surgery," Cvelbar says. "You really don't feel like it." But having peer support made it easier, she says. "We could joke with each other. We were equally in pain, so we could relate." "The sooner rehab begins the better," says Dr. John Woodward, Cvelbar's orthopedic surgeon and section chief of orthopaedic surgery at Swedish. "You've got to stretch those tissues right away, because the body wants to scar," Woodward says. In fact, the increasing number of baby boomers seeking joint replacements today need to know that taking rehab seriously is just as important as finding a skilled surgeon. A study published in the June issue of the journal Clinical Rehabilitation reinforced what Woodward and his HealthONE colleagues already know. It found patients who started rehabilitation for total-knee replacement surgery for osteoarthritis within 24 hours had less pain, shorter hospital stays and greater range of motion than their counterparts who began therapy in 48 to 72 hours post-surgery. 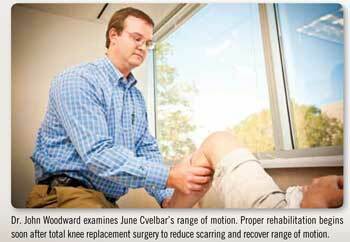 If patients don't stop scar formation, they might never regain full leg extension and range of motion, Woodward says. And for people like Cvelbar, whose knee deterioration was speeded by a love of hiking, biking and racquetball playing, that just isn't an option. Cvelbar's chief worry about having surgery was being forced to sacrifice her activities. "I have not been able to go out and play like I would like in the summer. It takes a commitment," says Cvelbar, who was in the midst of her final six-week outpatient rehabilitation in August, which followed two weeks of in-home rehab. She also knows her days of racquetball are done. But at least the hard work and lifestyle changes were not a surprise, thanks to pre-op classes and resources Swedish provided beforehand, Cvelbar says. "And that's good; they took the fear out of it." "We've learned the importance of education through our experience with Lamaze and pregnancy," says Dr. Steven Traina, an orthopedic surgeon at Rose Medical Center, which also offers pre-op classes. "You don’t get pregnant and that's it. We teach people what to expect with the whole delivery process. It's the same with knee surgery; by teaching them what to expect, it becomes less dramatic and results in better patient recovery." And as if pushing patients into walking and bending within hours of surgery weren't enough, Woodward and Traina are big fans of prehabilitation: giving patients exercises to do pre-surgery. "If you undergo a strong dedication to strengthening your muscles with exercises, such as bicycling or swimming, for the six weeks before surgery, the literature shows that your recovery is better," Woodward says. Counseling on nutrition and assuring chronic illnesses, such as diabetes, are under control are part of pre-habilitation. "The better shape the patient is in," Traina says, "the better they are going to do and the less chance of complications." Cvelbar has done it all, and is confident her dedication will pay off. "I'm in the working hard stage now. People need to realize that it takes time every day, and it’s no cake walk or anything. But I've had other friends who have had it done, and, for the most part, people usually wind up saying: Gee, I wish I'd had it done sooner. Just do your exercises and work hard. It will be worth it." Lose Weight Patients who are overweight can delay surgery by dropping a few pounds, taking the pressure off of their knees. Lower Impact Patients who frequently take part in high-impact sports, such as running or playing basketball, should switch to lower-impact sports before resorting to surgery. Seek Relief If simple medications like Tylenol or Advil, or injections, such as cortisone, provide enough relief, patients should consider waiting. Support It Sometimes, knee braces or sleeves provide enough relief to delay surgery. 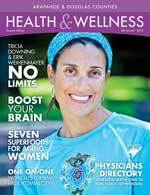 This article appears in Health & Wellness Magazine by Solve Publications.